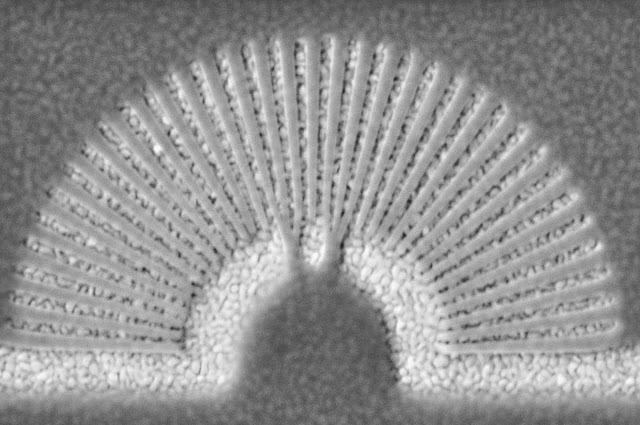 Looking like a miniature Slinky, a new lens can manipulate and resolve light in ways impossible for traditional lenses. Researchers say this "hyperlens" may help detect early-stage cancer and identify single molecule sequences. This "Slinky" hyperlens measures a few micrometers across. The light-colored, grainy layers are made of gold and the darker, smoother layers are made of a transparent thermoplastic, PMMA. The two slits in the gold at the bottom of the arch create a 250-nanometer-wide object to image. Credit: Sun et al. 2015.
as the spacing between them decreases. Eventually the two points merge in a blur. Traditional lenses can only resolve so much detail. A fundamental "diffraction limit" prevents microscopes from imaging features smaller than about half the wavelength of light used. For yellow light with a wavelength of 780 nm, this limit is about 390 nm. Any object or feature smaller than this, including viruses, proteins, and many molecules, would simply be a blur in traditional microscopes. Now researchers at the University at Buffalo have engineered a new type of lens that breaks this barrier and resolves objects to at least 250 nm using yellow light, as they describe in a recent paper in Nature Communications. This feat is possible by building the lens out of very thin strips of gold and PMMA (a transparent thermoplastic) arranged into a fan-like arch, giving the "hyperlens" extraordinary optical properties. The grating manages to captures so-called evanescent light in a way that traditional lenses can't and converts it into normal propagating light. The extra information carried by the evanescent light allows researchers to see detail beyond the traditional diffraction limit. Previous hyperlenses have been built with concentric layers of silver and an insulating material, instead of radial strips, and suffered from large optical losses. This new design has minimal losses and can be adjusted to focus any wavelength of visible light, not just yellow light, according to the team. "There is a great need in healthcare, nanotechnology and other areas to improve our ability to see tiny objects that elude even the most powerful optical systems. The hyperlens we are developing is, potentially, a giant step toward solving this problem," said Natalia Litchinitser, professor of Electrical Engineering at the University at Buffalo and lead author on this paper, in a press release on Friday. Before and after: The experiment setup with the hyperlens covered in a capsule-shaped gold coating. Two slits spaced 250 nm apart act as the object to image. With the hyperlens in place (figures a and b), the two peaks from the slits are resolved. 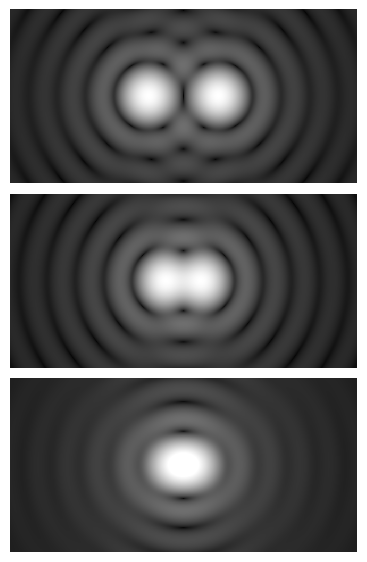 Without the hyperlens (figures c and d), the two peaks are indistinguishable. Credit: Sun et al. 2015. Litchinitser and her colleagues hope to use their new lens to develop high-resolution medical endoscopes: flexible instruments with a light and microscope at the end used to look inside the body. A hyperlens coupled with an optical waveguide could improve current endoscope resolution from 10,000 nm to about 250 nm, small enough to detect certain types of cancer at an early stage with minimal invasion. This resolution could also help scientists directly see and identify single molecules, and use light to print nanoscale circuit boards for new optoelectronic devices and data storage devices using a technique known as optical lithography. In 2009, a similar radial design was used to create a hyperlens for sound waves, produced by the same team that created one of the first optical hyperlenses. By Tamela Maciel, also known as "pendulum"
Octopus-inspired Robotic Arm Manipulates "Organs"